Hand-made items for sale during last year's Gazebo Art Festival. Nearly two dozen local artists will have their work on display and for sale in Chandler Park this Saturday, Sept. 8. Gayle Carper, one of the organizers of the festival, said the participating artists are extremely talented in a variety of mediums including photography, jewelry and pottery. “Everything we have there is hand made by the artists who are showing it,” Carper said. The Gazebo Art Festival is part of a 50-year tradition of having an annual event celebrating art in downtown Macomb. GAF is a juried art show, meaning that the artists have to apply and get accepted into the show. They will also participate in a competition on the day of the event. Another talented local artist, Melissa Inman, is serving as the judge this year and will give out awards for ‘best in show’ and other categories. There will also be a ‘people’s choice’ award, which Carper said is an opportunity for anyone who attends the festival to cast a vote for their favorite artist. But, it’s not just a competition. Artists will also be selling their hand-made items and one of a kind creations. In the afternoon, WIU Art Professor Ian Shelley will lead a pottery demonstration with some of his students. “You’ll be able to see first-hand how people make those beautiful pots they are selling,” Carper said. The Gazebo Art Festival is held on Saturday in conjunction with the Macomb Balloon Rally at Western’s Vince Grady field. Carper hopes many attendees go to both events. “While the Balloon Rally has activities in the early morning and evening and then the Gazebo Art Festival is something to do during the day,” Carper said. Chandler Park in downtown Macomb will be buzzing with activity this Saturday. Vendors with the farmer’s market will be set up in the morning. There’s a sidewalk chalk art contest open to all hosted by Macomb Downtown Development. Anyone looking for a good book to read can check out the Friends of the Macomb Library annual fall book sale. 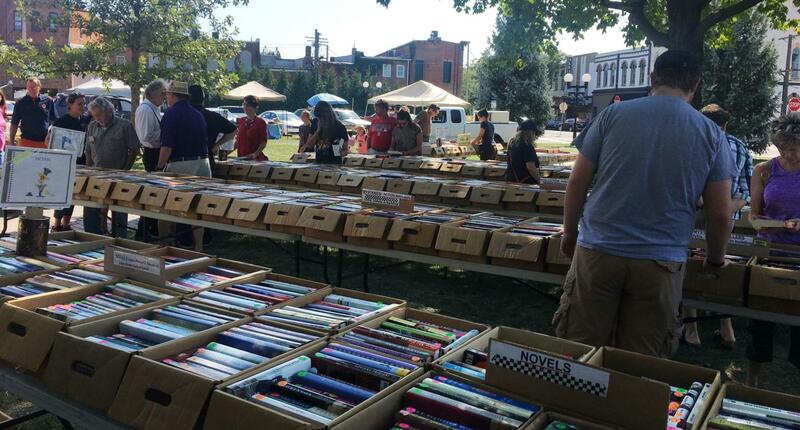 There will be rows of tables set up that are overflowing with books for sale from all genres. Becky Parker, one of the book sale organizers, said paperbacks typically start at 75 cents and hardbacks costs $2 each. In the event of rain, the Gazebo Art Festival will move indoors to the West Central Illinois Arts Center which is located on the east side of the downtown square.